Heraklion (, Greek: Ηράκλειο, Irákleio, [iˈraklio], Turkish: Kandiye, Italian: Candia) is the largest city and the administrative capital of the island of Crete. It is the fourth largest city in Greece and the third urban area in Greece. According to the results of the 2011 census, the population of the city proper was 140,730 inhabitants, the municipality's was 173,993 while the Heraklion urban area has a population of 225,574 and it extends over an area of 684.3 km2 (264.2 sq mi). The Arab raiders from Andalusia (Iberia) who founded the Emirate of Crete moved the island's capital from Gortyna to a new castle they called rabḍ al-ḫandaq (Arabic: ربض الخندق‎‎) Castle of the Moat in the 820s. This was hellenized as Χάνδαξ (Khándax) or Χάνδακας (Khándakas) and Latinized as Candia, which was taken into other European languages: in Italian and Latin as Candia, in French as Candie, in English as Candy, all of which could refer to the island of Crete as a whole as well as to the city alone; the Ottoman name was Kandiye. 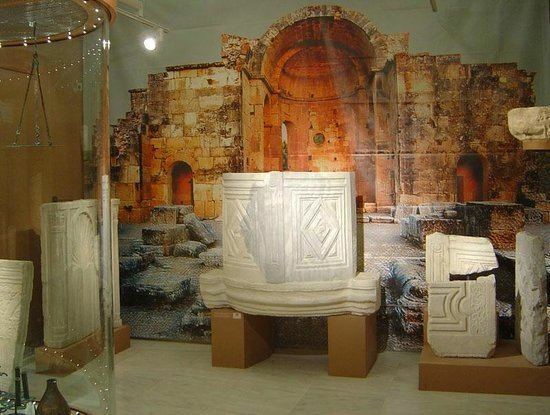 The present city of Heraklion was founded in 824 by the Arabs under Abu Hafs Umar who had been expelled from Al-Andalus by Emir Al-Hakam I and had taken over the island from the Eastern Roman Empire. They built a moat around the city for protection, and named the city ربض الخندق, rabḍ al-ḫandaq ("Castle of the Moat"). It became the capital of the Emirate of Crete (ca. 827–961). The Saracens allowed the port to be used as a safe haven for pirates who operated against Imperial (Byzantine) shipping and raided Imperial territory around the Aegean. In 961, Byzantine forces under the command of Nikephoros Phokas, later to become Emperor, landed in Crete and attacked the city. After a prolonged siege, the city fell. The Saracen inhabitants were slaughtered, the city looted and burned to the ground. Soon rebuilt, the town was renamed Χάνδαξ, Chandax, and remained under Greek control for the next 243 years. In 1204, the city was bought by the Republic of Venice as part of a complicated political deal which involved, among other things, the Crusaders of the Fourth Crusade restoring the deposed Eastern Roman Emperor Isaac II Angelus to his throne. The Venetians improved on the ditch of the city by building enormous fortifications, most of which are still in place, including a giant wall, in places up to 40 m thick, with 7 bastions, and a fortress in the harbour. Chandax was renamed Candia and became the seat of the Duke of Candia, and the Venetian administrative district of Crete became known as "regno di Candia" (kingdom of Candia). The city retained the name of Candia for centuries and the same name was often used to refer to the whole island of Crete as well. To secure their rule, Venetians began in 1212 to settle families from Venice on Crete. The coexistence of two different cultures and the stimulus of Italian Renaissance led to a flourishing of letters and the arts in Candia and Crete in general, that is today known as the Cretan Renaissance. After the Venetians came the Ottoman Empire. During the Cretan War (1645–1669), the Ottomans besieged the city for 21 years, from 1648 to 1669, perhaps the longest siege in history. In its final phase, which lasted for 22 months, 70,000 Turks, 38,000 Cretans and slaves and 29,088 of the city's Christian defenders perished. The Ottoman army under an Albanian grand vizier, Köprülü Fazıl Ahmed Pasha conquered the city in 1669. Under the Ottomans, the city was known officially as Kandiye (again also applied to the whole island of Crete) but informally in Greek as Megalo Castro (Μεγάλο Κάστρο; "Big Castle"). During the Ottoman period, the harbour silted up, so most shipping shifted to Chania in the west of the island. 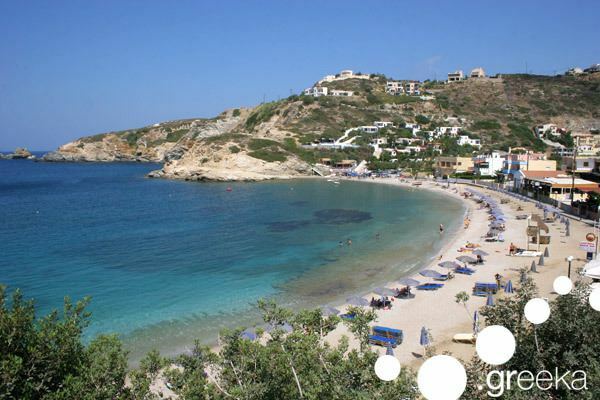 In 1913, with the rest of Crete, Heraklion was incorporated into the Kingdom of Greece. Heraklion became capital of Crete in 1971, replacing Chania. At the port of the city dominate the Venetian constructions, such as the Koules Fortress (Rocca al Mare), the ramparts and the arsenal. Around the city can be found several sculptures, statues and busts commemorating significant events and figures of the city's and island's history, like El Greco, Vitsentzos Kornaros, Nikos Kazantzakis and Eleftherios Venizelos. Also, many fountains of the Venetian-era are preserved, such as the Bembo fountain, the Priuli fountain, Palmeti fountain, Sagredo fountain and Morosini fountain (in Lions Square). The municipality has an area of 244.613 km2, the municipal unit 109.026 km2. 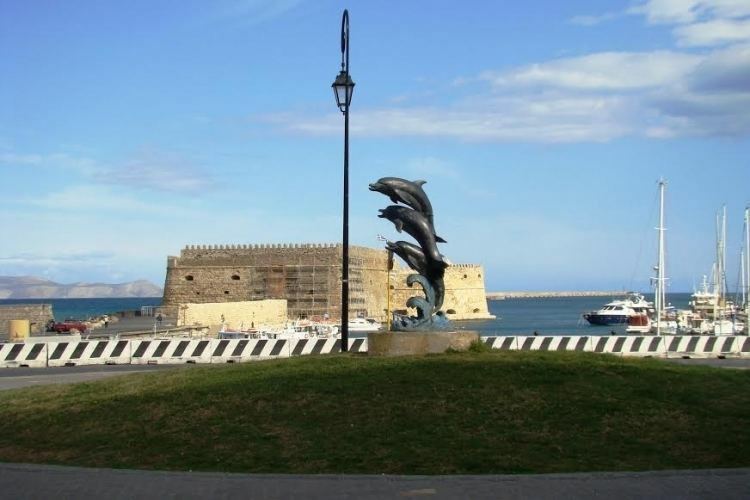 Heraklion is an important shipping port and ferry dock. Travellers can take ferries and boats from Heraklion to destinations including Santorini, Ios Island, Paros, Mykonos, and Rhodes. There are also several daily ferries to Piraeus, the port of Athens in mainland Greece. Heraklion International Airport, or Nikos Kazantzakis Airport is located about 5 kilometres (3 miles) east of the city. The airport is named after Heraklion native Nikos Kazantzakis, a writer and philosopher. It is the second busiest airport of Greece and the 67th in Europe, because of Crete being a major holiday destination with 6.742.746 travellers in 2016 []. European route E75 runs through the city and connects Heraklion with the three other major cities of Crete: Agios Nikolaos, Chania, and Rethymno. There are a number of buses serving the city (more information visit ) and connecting it to many major destinations in Crete . A study from the year 2000 investigated the feasibility of two tram lines in Heraklion. The first line would link the Stadium to the airport, and the second the center of Heraklion and Knossos. No approval has yet been given for this proposal. A new temperature record for February was set at 27.8°C, reached on 15 February 2016. Heraklion has been the home town of some of Greece's most significant spirits, including the novelist Nikos Kazantzakis (perhaps best known for his novel Zorba the Greek), the poet and Nobel Prize winner Odysseas Elytis and the world-famous painter Domenicos Theotokopoulos (El Greco). Niccolò Comneno Papadopoli (1655–1740) lawyer, historian and librarian.